Join us for Fun Food And Fellowship. 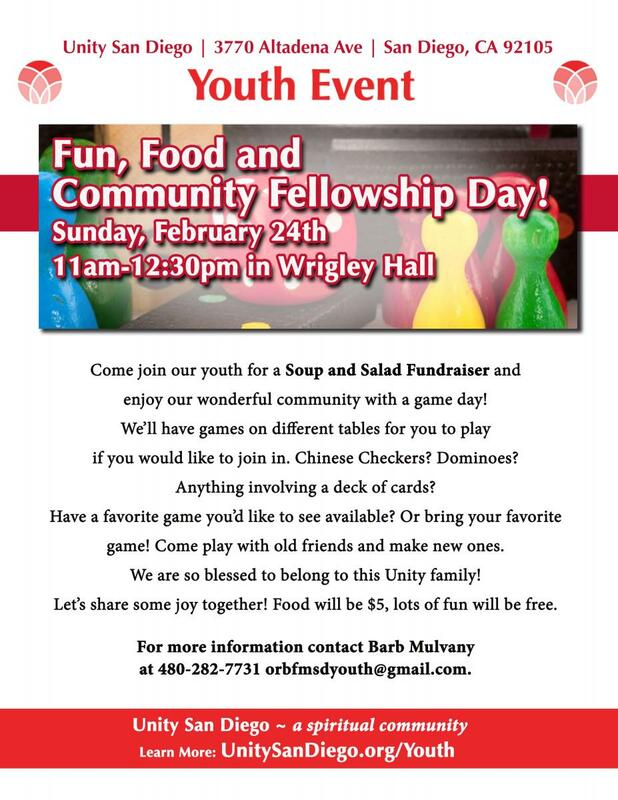 Come join our youth for a Soup and Salad Fundraiser and enjoy our wonderful community with a game day! We’ll have games on different tables for you to play if you would like to join in. Chinese Checkers? Dominoes? Anything involving a deck of cards? Have a favorite game you’d like to see available? Or bring your favorite game! Come play with old friends and make new ones. We are so blessed to belong to this Unity family! Let’s share some joy together! Food will be $5, lots of fun will be free. For more information contact Barb Mulvany at 480-282-7731 orbfmsdyouth@gmail.com.